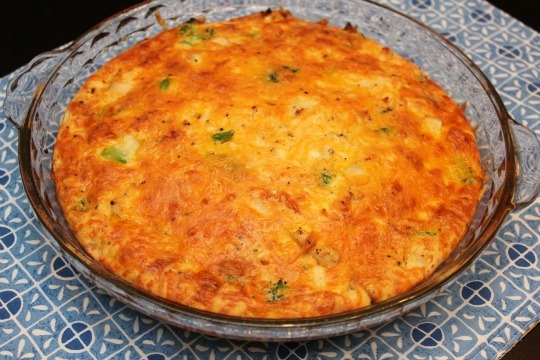 I love it when I find new recipes to add to our dinner rotation. The hubby gave this one the thumbs up and it's pretty healthy too. This meal is so easy to put together, especially if you already have the cooked chicken on hand. I planned ahead and baked 3 boneless chicken breasts the evening before while I had the oven hot from that dinner. I just simply put the chicken breasts on a cookie sheet covered with cooking spray. Topped them with some sea salt, fresh ground pepper and a drizzle of olive oil on each. I baked them in a 350 degree oven for about 30 minutes. After they cooled I cut them into small pieces and put them in the fridge. I used Nature's Promise Frozen Organic Broccoli florets and they were the perfect size, so no extra chopping was needed. Preheat oven to 400 degrees. Spray 9-inch glass pie plate with cooking spray. 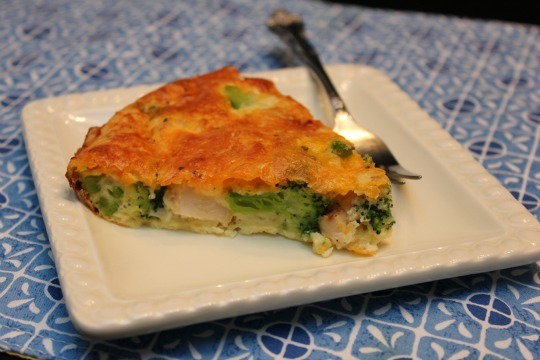 Sprinkle broccoli, cheese, chicken and onion in the pie plate. In a medium bowl, whisk eggs, milk, Bisquick, salt and pepper until combined. Pour into pie plate. Bake 35-40 minutes or until a knife inserted in the center comes out clean. Don't forget to follow Me and My Pink Mixer on Facebook and Twitter. Ohhh. I love this. I am sure my bratty kids would turn their noses up at soooooooo more for me!